With nearly 5,000ft of prominence, the 12,000-foot Mt. Moriah is overshadowed by Wheeler Peak and the Great Basin National Park just 20mi to the south. Still, Mt. Moriah lands on a number of peak lists and is worthy of a visit from any peakbagger. With a high-clearance vehicle, one can drive to within 2.5mi of the summit, making for a moderate effort with about 2,000ft of gain. With a low-clearance car, you may find yourself walking an additional 9mi each way with far more gain. I had driven up to about 10,000ft the night before to camp in the high country northwest of Mt. Moriah. It was a fine escape from the heat in the valleys below and I went to bed in the back of the jeep by 9p with the outside temp around 58F - I slept quite comfortably. It was 10 degrees cooler when I woke in the morning before 5a, already it was light out and sunrise would come before 5:30a. I spent half an hour driving the remaining distance to the TH, a delightful drive in the early morning hour while I ate my breakfast. Starting out soon after sunrise, I followed what is more or less the standard route up the NW Ridge. The ridge rises steeply at first, but then becomes a pleasant stroll for the next mile, traversing the ridge, partially forested, with nice views of Moriah and distance views to the west. 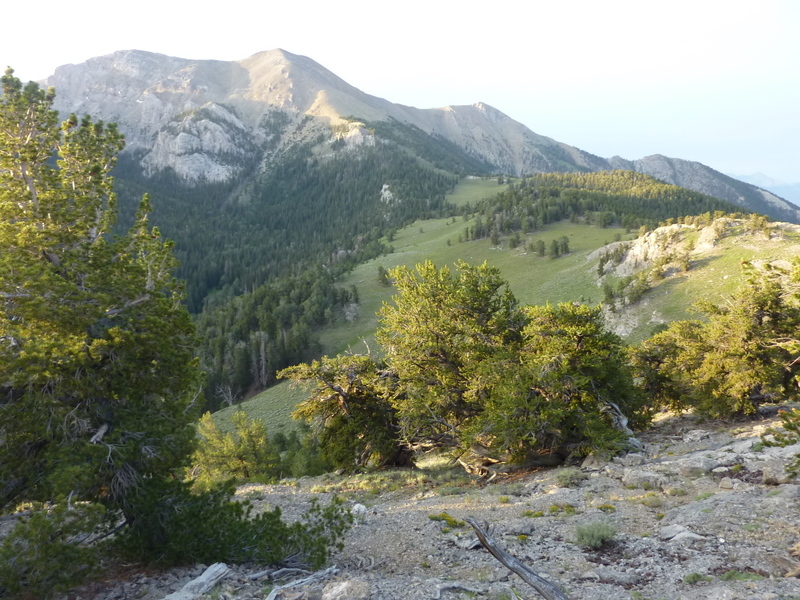 The gentle ridge ends and becomes steep again, first up through forest and sage, then low scrub above treeline with good footing for the last 1,000ft. I topped out after an hour and half's effort, where a rock windbreak is found, along with a benchmark and register. Too many entries in the book for this popular peak to bother photographing, suffice it to say it attracts all sorts of folks. The views today were again hazy, with added gray overcast to mute colors. On a whim, I decided to descend the NE Ridge, a rough-looking but rather easy class 2 effort that can be taken down to a trail at around 11,000ft. Another TR on PB had mentioned using this as an alternate, somewhat longer route. The slopes coming off Moriah have more loose talus than the NW Ridge, so if doing a loop I'd recommend doing it in the same counter-clockwise direction. The trail conveniently goes back to the TH where I'd started, but I first paid a visit to the highpoint of The Table, a high plateau NE of Mt. Moriah. I found an aluminum hunting arrow along the way, and ironically, a small herd of deer spied me a minute later and took off in a hurry. The summit has little prominence but nice views, a shameless bit of stat-padding. I then descended to the SW down steepening slopes to intersect the trail as it switchbacks down the slopes and through forest. Once on the trail, it was easy to follow it back down into Big Canyon, then another mile and a half on a gentle grade up to the TH, getting me back in three hours' time. It was a very enjoyable loop, one I would highly recommend.